When you label yourself the first next-generation RPG, people take notice. The Witcher 3: Wild Hunt is not only the conclusion to one of the most highly regarded trilogies in recent memory, but the first true, big-budget role-playing game to come exclusively to next-generation platforms and PC. Everything we saw from the game at last month’s E3, from the combat to the expanded world, was encouraging, but the 45-minute demo just wasn’t enough. We decided to reach out to developer CD Projekt RED to get further details on the project, as well as pick the team’s brain on the Xbox One and PlayStation 4. StickSkills: We keep hearing about Wild Hunt’s open world, and how the geography players will be able to explore is more than 30 times bigger than what was seen in The Witcher 2. Does that mean the game’s quests and personality might be more dispersed, or will The Witcher 3 continue the series’ trend of being a “dense” RPG? Konrad Tomaszkiewicz, Game Director: The quest per pixel (we should trademark this!) metric is as high as it’s humanly possible in The Witcher 3. We’ve added quite a few people to the departments responsible for quest design and writing – we’re willing to go very far make side-quests seamless and coherent with the whole world you’ll get to explore. Nothing is generic; we try to avoid clichés as much as we can. There’s a lot of hard work involved as everything is being done by hand, we try to give every NPC a convincing backstory and every part of the land a bit of their own folklore. If you remember our E3 demo, where we showed the Leshen and the monster’s impact on the local folk who build something of a ritual around it, yeah, that’s what we mean. And it was “just” a side-quest. SS: At this point in development, are you sick of hearing the Skyrim comparisons? What do you think sets your game apart? KT: Skyrim is a great game and it’s always a good thing when people think well of your game. Having said that, The Witcher 3 is a story-oriented experience. What we excel at is reaching that center of the brain that’s responsible for evoking emotions – we constantly put stuff in and observe a full palette of gamers’ reactions. Sapkowski created a really believable and dark universe and this is something really unique to us. In this regard, adding the open world to The Witcher is just another step to make it a more complete experience and not the main feature of the game. We’re still focusing on the narrative, the world just got a lot bigger and the borders within it disappeared. 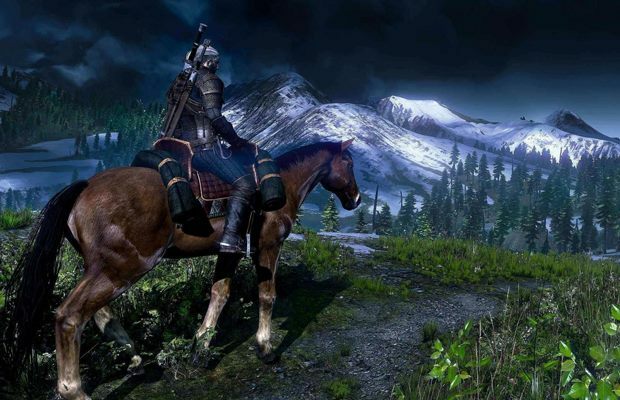 SS: Does The Witcher’s narrative priority at all hurt the combat? This is a franchise built on its story, but what are you doing in this third game to keep players interested in the mechanics? KT: It’s not like the narrative ever hurt the mechanic, or at least we hope so! To cater to the needs of those who prefer a good brawl, we’ve completely redesigned the combat while retaining the things that gamers told us worked in The Witcher 2. The fighting will be more intimate and the pace will be a bit slower making the whole experience less chaotic and more tactical. We’ve had several approaches to what we thought would be the sweet spot of a superior combat mechanic and this time, with all lessons learned, we think we nailed it. SS: With Wild Hunt coming to PlayStation 4 and Xbox One, what are the biggest challenges the team is facing as a traditionally PC-focused studio? KT: We’re creating a really big game for three major platforms at the same time – if something’s a challenge, it’s that. Additionally, developing on next-gen consoles is always a process to look forward to – working to get the max out of the hardware and thinking how one can creatively use the technology is always a blast. SS: What next-generation features interest you the most, and which ones do you think will actually benefit The Witcher 3? KT: The horsepower of the new hardware is something that will really help in terms of adding to the visual side of things. As far as the features, we’re very cautious about saying anything at this point because we don’t want to spoil the fun. Plus, we’re in the middle of testing various features now. To be perfectly honest, we’d rather wait for the official launch of the next-gens and present a full list of awesome features already implemented than to speculate. Get back to us closer to the launch date, we’ll gladly share a thought or two by then. SS: Do you ever see your team attempting to create an RPG similar to The Witcher that incorporates cooperative multiplayer? KT: No, not at this point. We’re focused on a strong narrative and this is something multiplayer games, even the ones offering cooperative play, do not offer at this point. When we tell a story we want it to resonate within gamers and some choices of plot elements we show are best to be experienced alone with no-one to say “I’d do this differently” shouting behind you. Cooperative play introduces an element of dissonance to the choice and consequence process and we’d like to avoid that. SS: We know this is the end of Geralt’s story, but could there be future games focused on other characters in this universe? KT: Honestly, it’s too early to talk about these things at this moment. What are you most excited for when it comes to Wild Hunt? Let us know what you think about the upcoming RPG in the comments below!